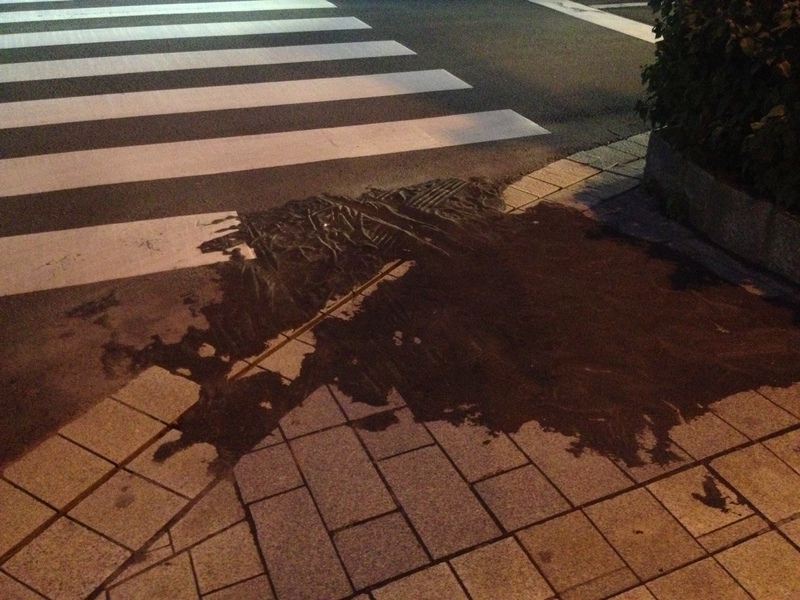 Day 12: Welcome Home to Kagoshima - Kampai! : Kampai! Last year when visiting Kyushu, I was amazed at how Kagoshima felt like home. Not only was it humid like Florida, where I grew up, but the people were warmer and friendlier than anywhere else I’ve visited in Japan. Since leaving last July I’ve been determined to come back. My entire plan for this trip was based on returning to Kagoshima to do a shochu internship at Yamato Zakura Shuzo, which I’d fallen in love with when I visited. It’s a tiny sakagura with only 2 full time employees. I knew they could use the help and they graciously agreed to let me come work with them for a week. I decided to travel for the past 11 days precisely to get used to speaking and listening to Japanese so that I wouldn’t be completely lost when speaking with other employees at the distillery. Thanks to the two izakayas, 16 different shochus, and late night ramen of the night before in Miyazaki, I got a later start to my train ride to Kagoshima than expected. I checked into my hotel, same one I’d stayed in last time, and decided to nap rather than sightsee. This was mostly a mistake, because Sakurajima, the active volcano across the bay from Kagoshima-Chuo erupted sending an enormous ash cloud into the sky. This eruption would have happened right about the time I would have gotten to the waterfront had I not napped. As it was I had to rush to the water side in order to get a twilight picture of the most active volcano on earth. Every morning the streets of Kagohima are covered in ash and every day untold numbers of residents spend their days sweeping. Why anyone would live like this is anyone’s guess, yet I have little doubt I’ll live here one day. Akiko-san, who’d been my interpreter last year when I visited Komasa Shuzo, met me at my hotel to pick me up for dinner. We met Fabian, a recent French expat and now teaches French at a cafe – someone actually pays him well enough to do that that it was worth moving from France. 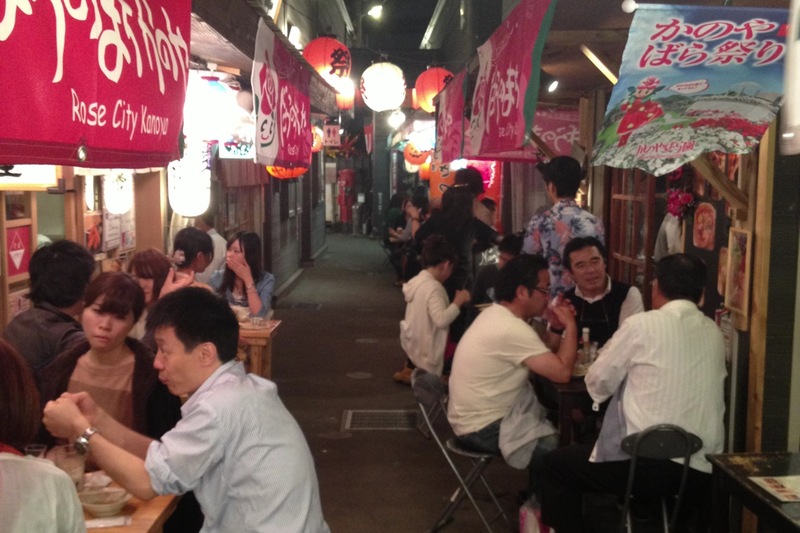 We went to Yatai Mura, a village of yatai restaurants. Our first stop was shabu shabu, then tori sashi (rare grilled chicken in Kagoshima style), then a pizza place. 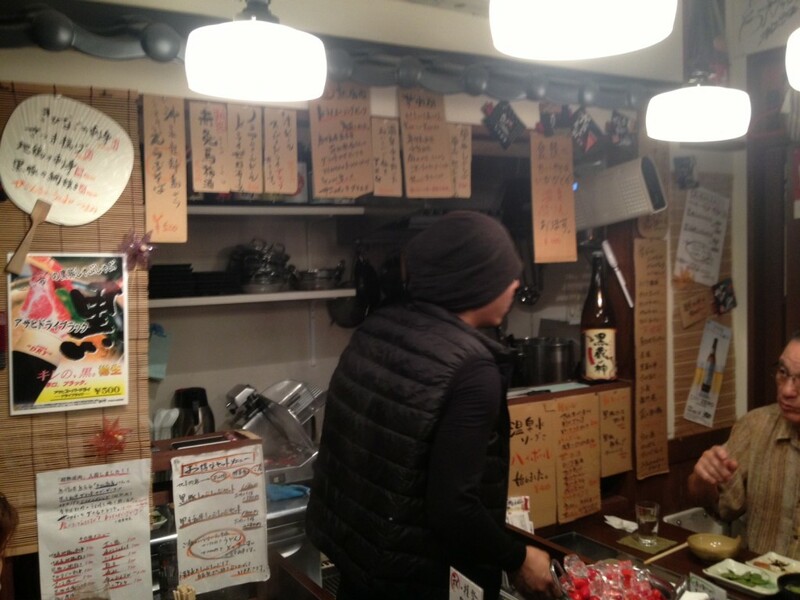 Each stop had at least a dozen different shochus, all chosen to match the food they were serving. This is how every restaurant should be in my opinion. 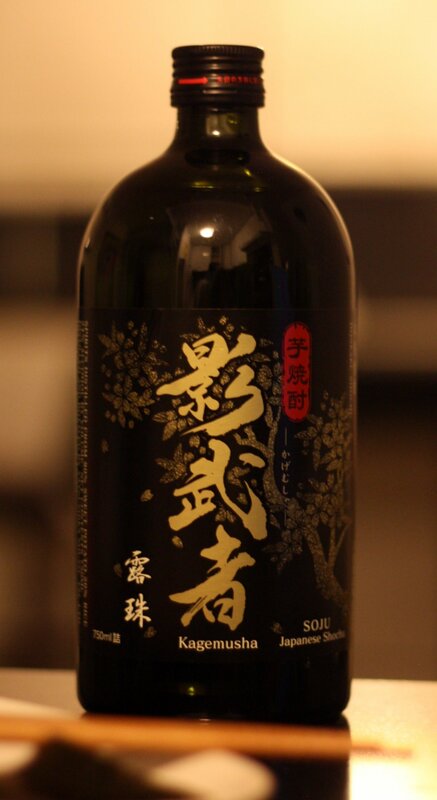 Shochu should be the wine of distilled spirits. We finished the night at a new shochu bar in Yatai Mura, which is runby another friend of mine, Noriyuki-san, who used to be the manager of the big shochuya in Kagoshima-Chuo Train Station. 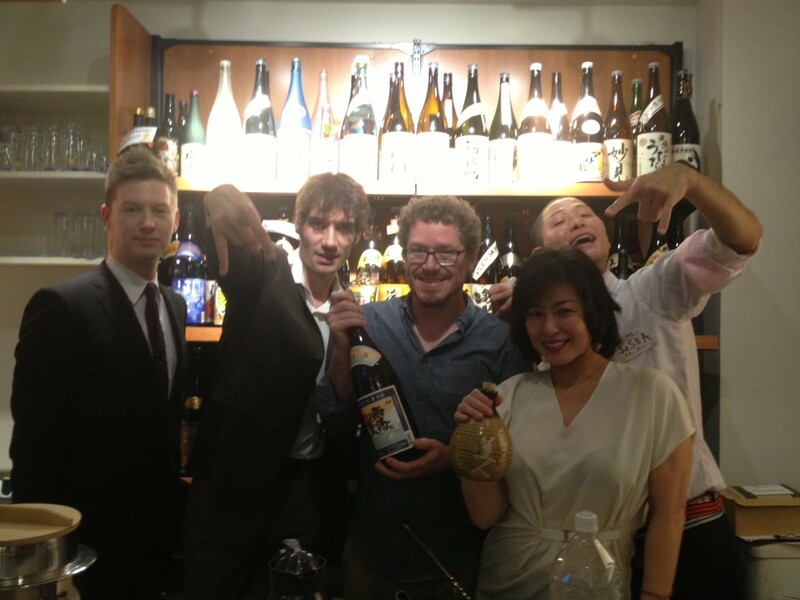 Another of Akiko-san’s friends, Mitch (from Las Vegas), joined us, turning the little shochu bar into an expat bar, at least for a night. I would have loved to stay later, but I have to catch an early train to Ichiki to start my internship in the morning. I’ll be back in Kagoshima-Chuo at least twice before I leave so hopefully I’ll get to see them again. Tantakatan is an easy drinking shochu with distinct shiso notes and aromas, though it also carries a bit of seaweed funk in the nose. It’s not as strongly shiso-flavored as you get form a shiso-infused shochu (Uminoie in NYC makes it in-house if you’re ever hoping to try). Toyonaga, the “Land of Plenty” shochu, is made by toji Jiro Toyonaga with premium milled Yamada Nishiki rice in the Kuma Valley (aka, Shochu Valley) of Kumamoto Prefecture, which gives it the special designation of being a kumajochu, which is to kome shochu what Champagne is to sparkling wine. Satsuma Mura, a traditionally distilled honkaku imojochu from Kagoshima (home of the most famous imo shochus), is a mouthful of contradictions and complications. A fragrant, earthy nose as if you’d just dug a sweet potato out of the dirt and sliced it open promises a rich flavor that this shochu delivers without reservation.